If you have a soundproofed room you will either have to open the doors periodically to let fresh air in or you will want to install some form of fresh air supply. Commercial systems often escalate the overall budget considerably so below we have prepared a few tips below to help you if you wish to construct a fairly efficient DIY system. The first thing to remember is that large fans are quieter than small fans and that centrifugal fans are quieter than axial fans. Choosing a more suitable fan over a noisy one will help from the start. The lowest possible airflow velocity with the largest possible duct size is what will eventually produce the quietest results. Reducing the air velocity in a ventilation system can lower the noise output by up to 20dB or a 1/4 of the perceived loudness. 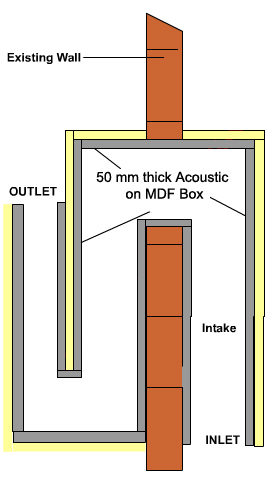 A sound absorbing plenum chamber Fig1. is an economical device which can achieve significant noise attenuation in an air supply system. This type of plenum with a 50mm thick acoustic lining using sound absorbing foam will give around 20dB of attenuation down to about 500Hz. If the unit was lined with 100mm thick material that figure would be uniform to about 100Hz. The performance of a chamber like this can be increased by increasing the ratio of the cross-sectional area of the inlet and outlet ducts with that of the chamber itself. Increasing the thickness of the lining will also produce additional performance benefits. The unit should ideally be located at the fan discharge to reduce the noise entering the duct system. The internal walls of a duct system should be smooth to reduce air turbulence which causes additional noise. 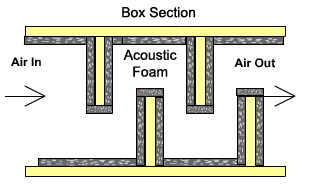 The duct layout should be simple with a minimum of branches. Round corners should be used over square corners with as large a radius as possible to minimise noise turbulence. Flaring the intake and outlet openings can substantially reduce noise. Flexible couplings should also be used to reduce fan noise transfer to structural elements. As well as lining a duct with acoustic foam to reduce internal noise, it should also be remembered that external noise will try to get into the duct. This can be reduced by covering the exterior of the ductwork with SAPT220 spaced layer sound barrier mat. Ducts can also transmit sound between rooms very effectively. The most ideal solution is to use separate ducts to feed each room and if that is not possible then at least position the ducts as far away from each other as possible. Simple DIY baffles are shown below. It’s best if an inlet one is positioned at the bottom of one wall and another outlet one is positioned at the top of the opposing wall for best results.